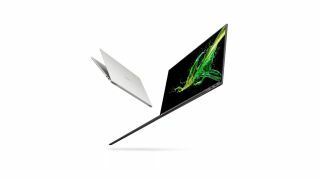 Acer announced the Acer Swift 7 at CES 2019, promising an even smaller device than last year's impossibly thin laptop. Slowing its pursuit of that 'world's thinnest laptop' title, Acer's flagship Ultrabook for 2019 is still just 9.95mm (0.39 inches) thin and weighs in at just 890 grams (1.96 pounds). A smaller chassis allows the Acer Swift 7 to shrink the bezels even more this year around, achieving a screen-to-body ratio of 92%. The monitor itself is a Full HD 1,920 x 1,080-pixel panel with a 100% sRGB color gamut. The focus on crafting such a thin and light laptop hasn't come at the expense of durability, as the new Acer Swift 7 is made with magnesium-lithium and magnesium-aluminum alloys. Acer claims that these materials are two to four times tougher than regular aluminum, while also being up to 35% lighter. We weren't the biggest fans of the 2018 Acer Swift 7, as it pulled out the clicking functionality from the touchpad, and featured a behind-the-curve Intel 7th-generation fanless processor. Acer is addressing these complaints by including an 8th-generation Intel Amber Lake fanless processor, similar to what's found on the 2018 MacBook Air, and an integrated click button in the touchpad. Acer claims the Swift 7's processor will enable 10 hours of battery life. And, when paired with the 16GB of RAM and 512GB SSD, the Acer Swift 7 will deliver "top-notch performance for web browsing" and "productivity with presentations and spreadsheets". Acer also claims that it can handle creative tools, but that'll likely be limited to some Photoshop work. Finally, there's the new touchpad. Made of Corning Gorilla Glass, it should be both durable and responsive. And, Acer has listened to feedback, and has integrated a physical clicking mechanism into the Swift 7's touchpad. The Acer Swift 7 hopes to appeal to the same kind of luxury mobile audience as the Apple MacBooks, and will be out in the US in May at $1,699 and Europe in April, at €1,799. Specific UK and Australia availability information is forthcoming.